This is part of my Semana Santa series where I feature rituals and traditions observed in certain places during this most solemn week in the Catholic calendar. Click on the image at the right to check the rest of the articles. Paete in Laguna is known for its expert wood carvers and during Holy Week, it’s carving prowess is shown by the number of carrozas bearing lenten images, both contemporary and antique that have been done in the town well dressed and decorated. 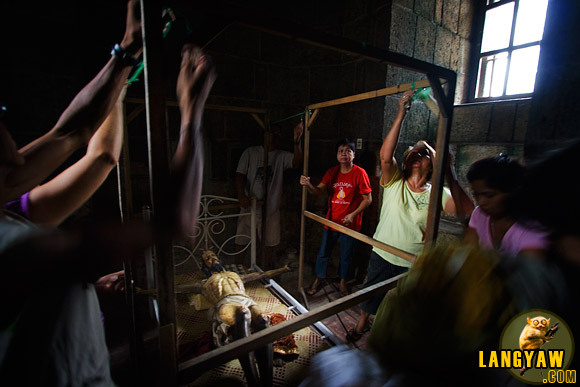 Also, it has one of the most unique santo intierro, the dead Christ laying in state that is jointed and undergoes a very unusual ritual akin to Cordillera death rites. The Friday before Holy Week, another image, that of the crucified Christ undergoes the same ritual but with lesser people and done below the belfry of the church. Getting ready for the makeshift tent where the image is smoked. CLICK TO ENLARGE. Rod Gajitos is an albularyo, a medicine man who leads the ritual. Once the antique image of the crucified Christ is taken down from the cross near the main portal, it is laid down on a spring bed with a banig, a native woven mat. The light from outside enters the high windows and cast the whole scene in some spectacular lighting that sets the mood for the solemn ritual. The women then spring into action. Cotton balls are dipped in the liquid mixture consisting of an aromatic oil and coconut vodka combined together and dabbed on the wooden image. It becomes a frenzy but at the same time, silent prayers are mumbled. Dips on the liquid and dabs on the surface alternates. The kubol, or makeshift tent is ready and smoking will be done. CLICK TO ENLARGE. 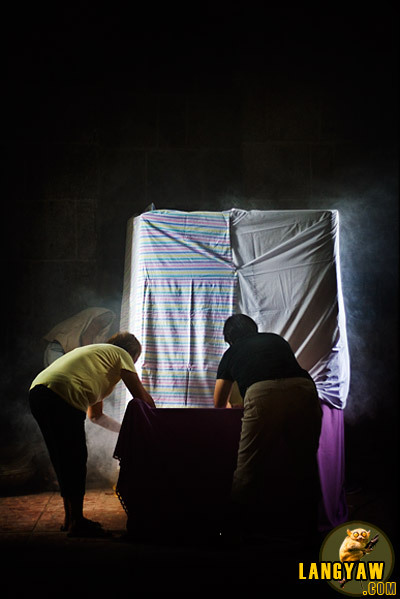 At some point, they stop and a wooden frame is assembled and it is then covered with blankets and cloth. The older women giving directions. At the sidelines, myrrh and other ingredients are prepared on a coconut shell and the smoke starts to envelope the small space. For the next three hours, the image of the Christ is smoked and left alone. A young devotee then came near, entered the tent and prayed as she was enveloped with the smoke, eyes closed and praying at the same time, touching the hands and face of the image. A successful pass at the examinations, I was told later. For me, it’s time to just wander around the town or linger and observe the impressive details inside the church. Those rococo altar retablos on the front and the sides are just too beautiful to miss. Or go outside and taste some native rice cakes and cold drinks. In this hot afternoon, the town is at a standstill except for the occasional boy on his bike passing the street. After three hours, the people return and start to remove the blankets followed by the wooden frame. The rosary is said while Rod silently chants before the image, raising his hands. A few minutes more and he motions for some of the men to come near and raise the image to be returned to the cross. The women silently mumble prayers as they end it with the sign of the cross. I missed this ritual when I went to Paete on holy wednesday last year. But I was able to meet with Sidney Snoeck. I was also expecting to meet you there as I was told by tutubi that you will be visting his hometown. may be next time bia! I am from Laguna but I never witnessed this. I regret that I didn’t catch this during my weeklong vacation back home, which coincided with the Holy Week.